The port city Turkmenbashi (formerly Krasnovodsk) - the only one large port in whole Central Asia, providing a link with European countries. Surrounded on the east by the crescent of low mountains, in the west it looks in the turquoise-blue waters of the Caspian Sea. The surrounding desert landscape looks more like a moon landscape. Most excursions into the mountains and the coastal resort towns begin from this dusty, and even somewhat sleepy town. The coast of the Caspian Sea is famous for its wonderful sandy beaches, clean, crystal water, abundance of sea flora and fauna, which allows to enjoy water kinds of sport. 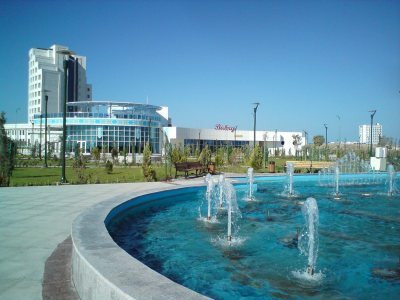 City of Khazar and the suburb of Turkmenbashi – Awaza, the health resort, in the sanatoriums and preventoriums prophylactic events of different kinds of pneumonia, are more popular among the vacationers. There is also a number of coastal tourism recreation centers. The beautiful subtropical zone of the country - Sumbar valley with green trees and the famous oak-old in the village Garrygala is located in Balkan province. 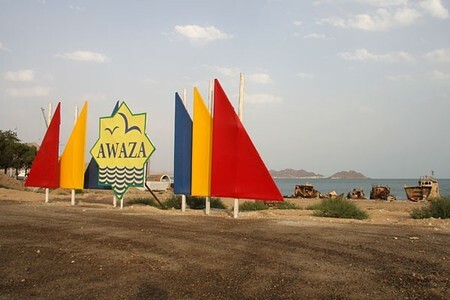 "Awaza" - heavenly sea corner which stretches for 16 kilometers. 6 hotels of world class and health complexes have been built for today. It is planning to open 60 hotels of different categories. Awaza becomes a sea resort zone. Beautiful hotels are functioning on the territory of Awaza, standards-based pensions, health complexes, child health centers, sport centers, will soon be operational, health spas, children's health centers, sports, cultural and entertaining centers will function. 7 kilometers canal was excavated on the territory of Awaza, and cozy restaurants and cafes are situated on both sides of the canal. Soon the construction of roofed ski complex is planning. The ski center will be built on the area of 20 hectares. The roofed 1200-meters alpine skiing track for three trails under 8 meters sheer dome and at the depth snow cover of half meter to one meter will have a six-meter vertical drop.120 people can assimilate the ski art simultaneously here.